In the sidebar of my blog there is a "I'm making something 365" badge. Hmmm ... I was. Life happened. Perfectionism happened. Creativity stopped happening. The 365 creative challenge is simply to make something creative every day for a year. To help, Noah put together a book with 365 ideas. The problem was, I started adding rules. Naturally, it all got to hard, so I quit. - use the book as an point of inspiration only. If it suggests building something out of clay, I don't have to actually use clay - as in, get my hands dirty sort of clay. I just use the word 'clay' to give my thoughts a direction. I did really well in January. Then I had to go back to work. Carting my sketch book on the train every day was just that little extra weight I didn't want to carry. I've gotten a little slack and side-tracked. I'm still working out how to overcome that. And that's okay because life as a recovering perfectionist is about recovery every day. At the moment, I have nearly 50 designs/scrawls/scribbles. Some of them I know I'll never ever make. Some of them I have made in the past - which was one of my 'rules'. Past creations were allowable. They're my creative effort (I rarely follow someone else's pattern, preferring to make my own glorious mistakes and triumphs). There are few that I really want to make. There are a few that really inspire me. 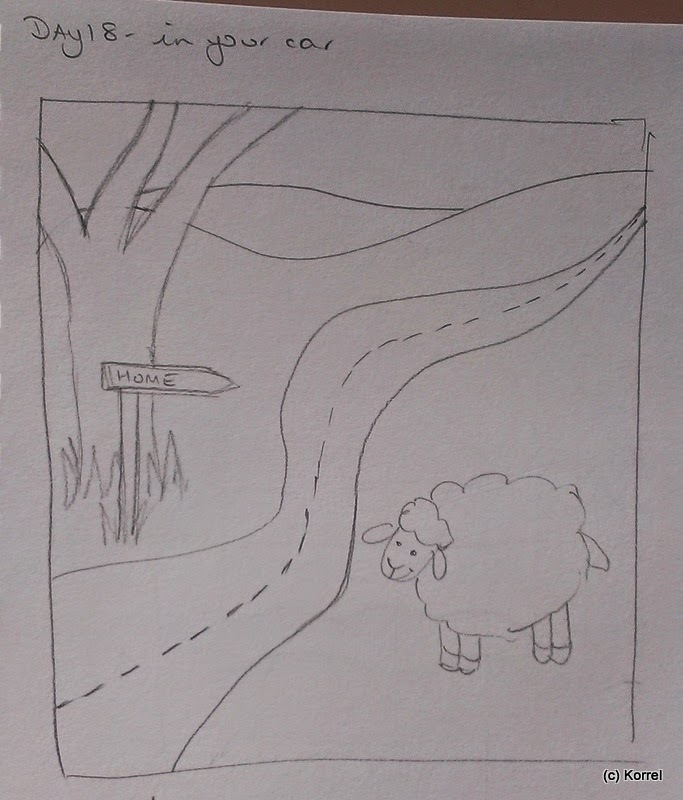 Day 31: Make a path for people to follow and invite people to try it out. One of my more structured designs. I actually was aiming for paths that cross over and under each other. 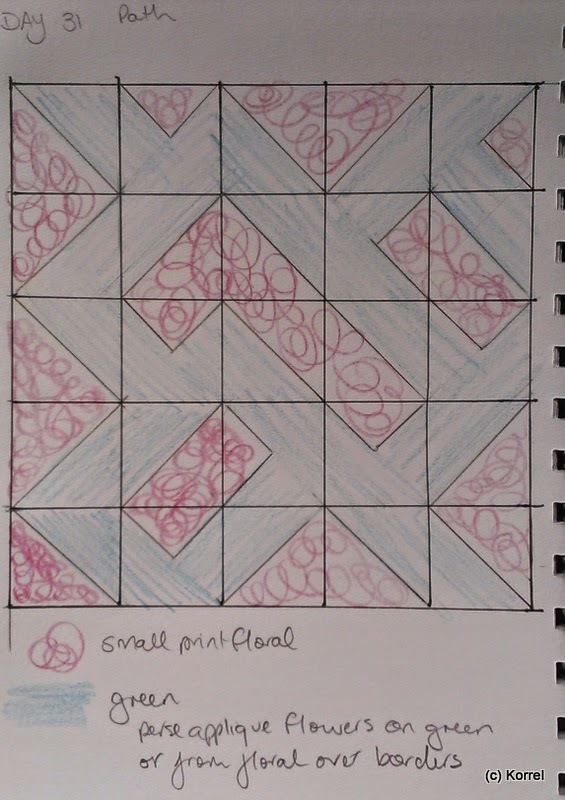 But I got sidetracked by trying to make my blocks simple half-square-triangles. I probably won't be making this one. Day 21: Write a 10 word love story. Illustrate it. 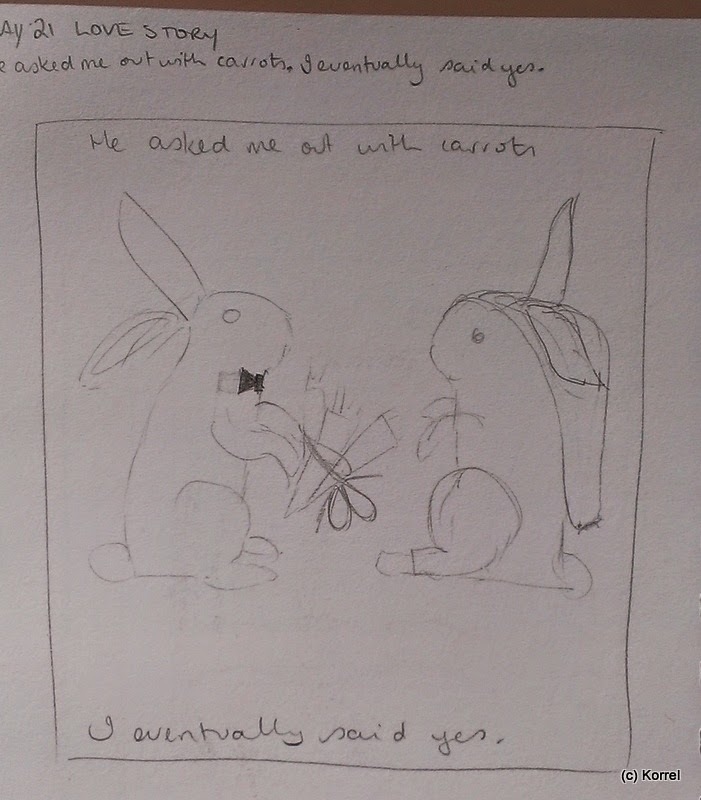 The Teen wants me to make this one :-) It's a long story, but essentially, not long after we first met, in the midst of any apology that was supposed to involve bunches of flowers, husband-to-be offered to buy me a bunch of carrots instead. Tip for all the males out there: when you're apologising for something - try to keep your mind on the apologies, and not the conversation being conducted by the person sitting next to you! The 10 word love story is, "He asked me out with carrots. I eventually said yes." This is an example of my rule to use the book as inspiration only and not the 'rules'. We were road-tripping, so instead of using 'inside the car', I chose to use outside the car. Day 2: What's your favourite animal? Use it as your inspiration. I have a number of favourite animals, but I do love fairy wrens. 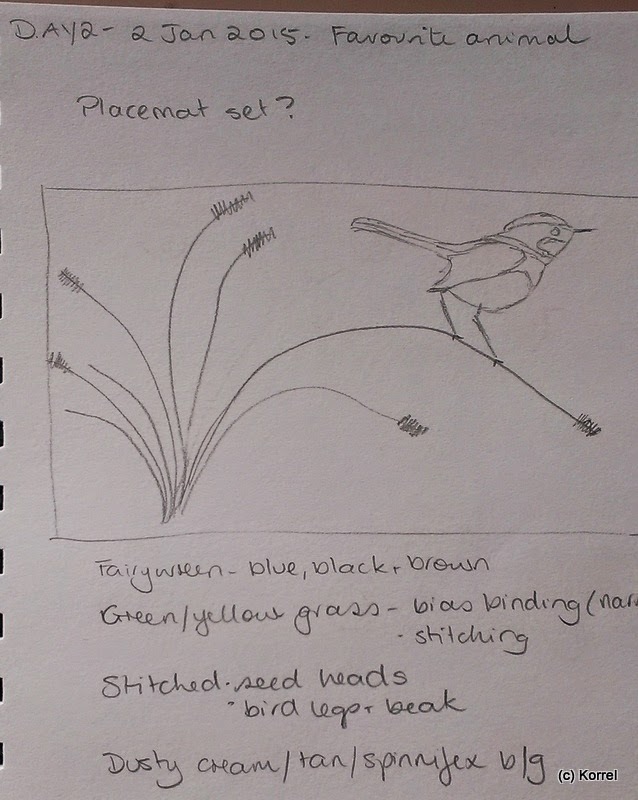 This is planned a set of placemats, which I am thinking of making at some point. The plan would be to deliberately make them all different. There are seven species, so more than enough to do a different one on each placemat. One of the interesting things I've found about this challenge is the attitude of other people. Although I'm currently struggling to form a habit that sticks, I am determined to complete all 365 designs even if not in a single calendar year. I happened to mention what I was doing to a quilting storekeeper (thankfully, not a local store). She all but scoffed, "Well, good luck with that!" And let me say - it was not a positive, uplifting wishing of luck! I was a little taken aback. She didn't know me from Adam (or Eve). For all she knew I could have already been a well-established designer. And whether I am or not, and I'm not, that's beside the point. It was pretty flipping rude for her discredit my ambition. I don't care who you are. I don't care what the dream is. Don't allow anyone - ANYONE - to pull it apart. And don't do it to anyone else. Dream big, and "phft" to all the naysayers.